New PPS DONATION page is now live and ready to receive donations! For more information or to make a donation please click HERE! Follow The PPS On Twitter! The Paediatric Pathology Society (PPS), started in 1955 as the Paediatric Pathology Club, is composed of pathologists who specialise in or have a major interest in the pathology of the fetus, neonate or child. The Society exists to promote paediatric pathology in its widest sense, embracing all the disciplines of pathology, but most members are now Histopathologists. Membership is largely European, reflecting the origins of the Society, but is open to those from anywhere in the world. The Society runs an Annual Scientific Meeting, with meetings generally happening in Europe. Donations to the Society have enabled the institution of a guest lecture - The John Emery Lecture - at the annual meeting and the Norman Brown Award is given for the best presentation by a junior member or guest. 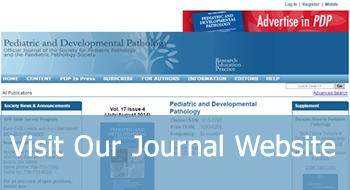 Please note that this site is www.paedpath.org, not to be confused with www.pedpath.org, which is our journal website. The 65th PPS/SPP Joint Meeting 17-19 October 2019 in Pittsburgh, USA. Pediatric and Developmental Pathology is the premiere journal dealing with the pathology of disease from conception through adolescence. The current PPS Newsletter is now available to view. This is the March 2019 edition! The current Paediatric Pathology Society AGM meeting is now available to view. Established in 2016 for the best presentation of a surgical paediatric pathology abstract. It is a great honour and privilege to be the PPS President, the Society I have been associated with for many years and through many roles. I am very grateful to those who supported my appointment to this office, and I will do my best to make the Society a welcoming home for all professionals involved in perinatal and paediatric pathology. My recent predecessors lead the Society through rather difficult times caused by many factors, some of them being external, and some internal. Many thanks to Rita Alaggio who did an excellent job by re-vitalising the Society at the time when it really struggled to attract its members to come to the annual meetings, and when a number of submitted abstracts was all-time low. A number of new sessions (“Meet the Expert”, “I never expected to see that”) have been introduced and well received by the meetings participants, and we will be looking to introducing more interesting sessions in order to make our meetings more attractive and rewarding. But at the end of the day, it will always depend on the members – if we come and present our work at the meetings, and actively participate in the Society’s activities, it will flourish and thrive. If not – it will struggle even to survive, competing with so many other pathology meetings around the same time of the year. The idea of having an 1-year term of office for the President, introduced in 2012 (implemented in 2015), proved not to be good for our Society, as it gave far too little time to the President to do what s/he wants to do (practically, being directly responsible for one meeting only), so it has been extended to two years, and the AGM has approved this change. The AGM has also approved a number of other changes in the Constitution, to make it more efficient and to reflect more the ‘real’ life, rather than having too many sub-committees which have never ‘lived’ but only existed on paper (you can see the new Constitution on the PPS website, as well as many other useful information, so please do visit it from time to time). We have discussed our future collaboration with the Perinatal and Paediatric Pathology Working Group of the European Society of Pathology since in the past the Working Group organized (very successfully) paediatric pathology programmes at the European Congresses of Pathology, but with no input from the PPS. Paula Borralho-Nunes, Chair of the Working Group, has agreed that in the future there is going to be closer discussion with the PPS about the programme, and the Chair of the Working Group will be a PPS Committee member. 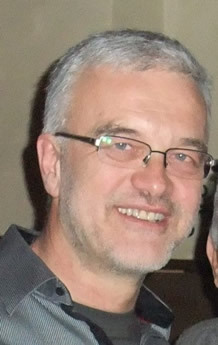 There is a feeling that paediatric pathology is under threat due to specialized reporting in surgical pathology, where organ specialists believe they could equally successfully report paediatric cases, but I think that there are still a lot of people who want to do, and enjoy doing perinatal/paediatric pathology, so we do not have to worry too much for our future as a specialty. A number of young people presented excellent papers in Lisbon, confirming this feeling. The IPPA Courses are oversubscribed, and there is a long waiting list to get in (and the next year will see the 40th IPPA Course, going back ‘home’, to Sheffield, where it all started by John Emery, in 1979), and the advanced course in paediatric pathology (Marian Malone Memorial Course) in Dublin earlier this year was also oversubscribed. Paediatric pathology sessions at the European Congresses of Pathology attract a lot of people, both paediatric and adult pathologists, the same is true with paediatric pathology sessions at the International Academy of Pathology congresses - and the only meeting which is undersubscribed is our Society’s annual meeting !?! Again, there a number of possible explanations for that, one being that it is increasingly difficult to find funding to come to a stand alone meeting like this one, with only 3-4 scientific sessions earning 12-14 CME/CPD points, so maybe we should start considering linking the meeting with something else, like the European Congress of Pathology, for example. The SPP has been doing this for decades, having their meeting just prior to the USCAP annual meetings, so people can attend both in one go. Or having an advanced course in paediatric pathology before or after the PPS meeting (as it was in Padova in 2010, and Perth in 2015). Any suggestion about how to make our meetings more attractive to the members and non-members is more than welcome, so please do write to me if you have something in mind. There are interesting years ahead of us, and the annual meetings being scheduled for Paris (2018), then a joint meeting with the SPP in Pittsburg (2019), very likely Belgrade in 2020, and we are considering a possibility of having a joint meeting with the SPP and SLAPPE in 2021 in Costa Rica! But to make these meeting successful, we need to present our good work and papers, so please consider doing that at the PPS meetings rather than at some more general pathology meetings. So, I hope that the Society is going to be in great shape with an excellent spirit of cooperation between the officers, the Committee and the members, as well as with other groups and societies which promote our discipline. More Meeting information coming soon!